My Night With Reg arrives on Shaftesbury Avenue at the Apollo Theatre! 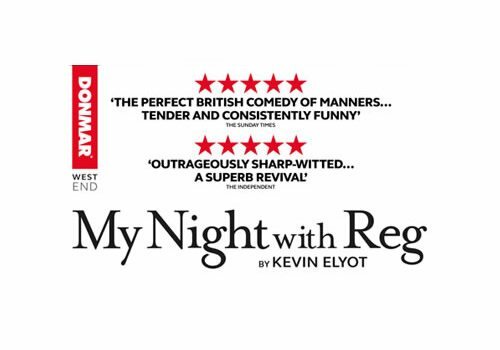 Hot off the back of a hugely successful sell out run at the trendy Donmar Warehouse, My Night With Reg transfers to the West End for a limited time only. The action begins in the 1980s and centres on a group of homosexual male friends living in London amid the AIDS crisis and all scenes take place in the lounge of Guy’s apartment. Guy is seemingly the least promiscuous of his friendship circle; instead of looking for one night affairs, he is more interested in a meaningful relationship and has a secret crush on his good friend John. Following an awkward and not 100% consensual hook up in Lanzarote, Guy recovers by throwing a flat warming party which all of his friends, save the conspicuously absent “Reg,” attend. It begins to become clear that, despite being in a relationship with Daniel, Reg sleeps around among the friendship group leaving tensions high. First performed in London in 1994, Kevin Elyot’s play returns some 20 odd years later and fins itself still applicable to the modern age. Directed by Robert Hastie, My Night WitH Reg will feature designs by Peter Mckintosh. My Night With Reg features adult themes and is therefore not suitable for children. Teenagers may attend the show with an accompanying adult.